You think famous but u never know The events leading up to fame. How about an MLB pitcher who played in the bigs for parts or all of 26 seasons. A pitcher with 288 career wins 2,245 strikeouts and three 20 win seasons. How could this player be the most famous pitcher of all time? Well all Tommy John had to do was get injured and decide he wanted to try something different. In 1974 John, then pitching for the dodgers, had a win-loss record of 13-3 when he damaged his ulnar collateral ligament. Thinking that was the end, he consulted a doctor who had an idea for a way to repair it. Dr. Frank Jobe performed the famous surgery on September 25, in which he replaced the ligament with a tendon from Tommy John’s knee. The whole 1975 season would be spent in recover and rehab. 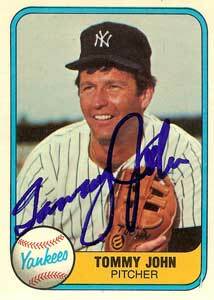 Although Dr. Jobe put the pitchers odds of pitching again at one in a hundred, John would go on to win 164 more games after the procedure. So your gonna take a tendon out of my knee and repair my elbow? From the time of the original to 1995 only 13 players would take on the radical idea. Most notably, in 1985 Toronto Blue Jays’ hurler David Wells went under the knife. How about 1993 when the Texas Rangers were getting slapped up by the Boston Red Sox. Outfielder Jose Canseco thought it a good idea to request the baseball and take the mound. Canseco then had a rather pedestrian outing (3ER on 2H 3BB) and injured his elbow. So it would seem Tommy John Surgery (TJS) wasn’t a bad idea, though so little players tried it . Canseco would still be able to launch homers & Wells would throw a perfect game 13 years after his surgery . The 20 years after the original surgery, it was deemed more than an idea. In 1996, however, the flood gates opened. Ten players would elect to get the ligament replacement surgery that year. That number spiked in 1999 to twenty two ..then the millennium changed and you had 26, 25,38,29, & 33 players from 2000-2004, then a drop from 2005 -2010 the list goes 13,10,7,8,8,&11. The last five years looks like a TJS auction where it seemed teams were bidding for slots. In 2011, 30 players, then a record 46 in 2012, 25, 29, and 18 (so far) this year. So it went front an idea to maybe a solution to an outright strategy. For instance, you could take the New York Mets route. Matt Harvey, their prized draft pick from a few years back, has already returned from the surgery and has posted a Sub 3.00 ERA and his velocity is still in the high 90s. Another prized arm Zack Wheeler went in for surgery in march…their strategy is to repair these arms while the other arms are viable. Their advantage is that all players involved are fairly young so why not. Their crosstown rivals The New York Yankees took a different approach. Ace Japanese pitcher Masahiro Tanaka felt discomfort in his elbow last season. The team and player decided not to go for the surgery and Tanaka while still effective has lost velocity on his fastball and has visited “the do” twice already since then. Bottom line, MLB teams & players are using TJS almost like a deterrent more than a cure. If he’s young and feels pain, why wait? It’s better to get it done now and wait the 14-16 months recovery time. Dr. James Andrews is the surgeon who performs most (if not all) the Tommy John Surgeries today. He says “Tommy John Surgery is still an uncertain procedure.” One report showed that 80% of TJS patients will return to pitch at least one game again while the percentage of players returning to their natural form dropped to about 57. It really depends on natural ability and a person’s body. To take a tendon from elsewhere in the body and implant that into a person’s elbow is unnatural. About as unnatural as a guy throwing a baseball 100 times every five days or even 20 times every day (relievers) . Next: Mr. Controversy’s NFL Diary-Where’s The QB Love (Geno), NFL Is Back!